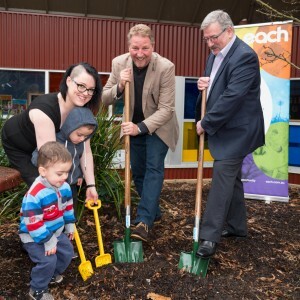 EACH’s long history of providing services to families in Melbourne’s Outer East will expand with the upcoming redevelopment of the Integrated Children and Family Centre in Ringwood East. 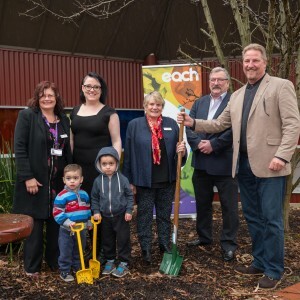 A local family, staff and builders were on site for a soil turning event on Wednesday, 30th of August 2017 to mark the commencement of Stage 1 works that will see the capacity of the child care centre increase from 90 to 122 spaces in 2018. Once complete, Stage 2 building works will commence which will be the full construction of a new integrated child and family centre. It includes early childhood intervention, maternal and child health, counselling services and a range of family medical services. The revamp will also allow for the inclusion of a family dental clinic, a high demand need in the Maroondah area. The total cost of the works is expected to be approximately $12M. The Minister for Children and Family Services, Jenny Mikakos attended the Centre on December 16, 2016 to announce capital funding injection of $1.6M in co-contribution to the overall development. The childcare service at the centre first opened in March 1979, providing the local community with a family support service that focussed on children with additional needs. The service was expanded in 2008 to provide early childhood care and education to local families and has continued its tradition of meeting the needs of the whole community through the provision of a range of integrated family services from the centre. Learn more about the child care centre here.